Should Chloe Grace Moretz Go the Ya Route? Too Late! Karen Tunny: [after the Tunnys first enter the old house] I wonder how old that Christmas Tree is? Sarah Tunny: At least they had a Christmas. Cardone working from a Davidson script is definitely the stuff of nightmares. But not in a good way. Having spent all of her money caring for her terminally ill spouse, recently widowed Karen Tunny (Lori Heuring) moves with her two daughters Sarah (Scout Taylor-Compton) and Emma (Chloe Moretz) to her late husband's run-down family home in rural Pennsylvania, where local legends speak of zombies who roam the woods at night. Just seeing the names of this film's writer and director in the opening credits was enough to send shivers up my spine: Boaz Davidson is the 'genius' responsible for penning the scripts for such STV titles as Octopus 1 & 2, Spiders and Crocodile, whilst J.S. Cardone gave us the godawful 'video nasty' The Slayer and dull vampire flick The Forsaken. 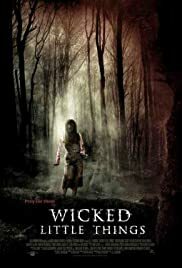 With such dubious talent responsible, I didn't expect much from Wicked Little things. And having just finished the film, I'm glad I kept my expectations low. Although the movie looks good at times, with lovely use of the eerie woodland locale, and the cast give reasonable performances given the clichéd drivel that they are working with, the plot is so laboured, poorly written, and derivative that it's impossible to be enthusiastic about. Most importantly, perhaps, the film's killers, undead children who rise each night from the mine in which they died, aren't in the least bit scary, a smudge of makeup, black contacts and some crappy joke shop scars doing very little to add to the sense of menace. Scout Taylor-Compton and company do their best to look afraid of the tiny terrors, screaming convincingly with every confrontation, but their admirable attempts to instill a sense of fear in the audience is to little avail: the little blighters just ain't got what it takes to chill the blood. There are a few lacklustre zombie chow scenes in a futile bid to win over gore-hounds, and the final kill, which sees the victim's blood drench both Compton and Heuring, is suitably tasteless, but on the whole, Wicked Little Things (AKA Zombies in the UK) is instantly forgettable trash—just another clunker in the filmographies of Cardone and Davidson.